The wrecker's hammer dealt the first blow to the "spite" house opposite the Historic Gen. Dodge Home at Story and Third streets Tuesday morning. The large old home will be removed to make a small park. Legend has it that the frame Squire house was built over 100 years ago to block Gen. Dodge's view over the city. Archway at the Dodge House porch frames demolition action. 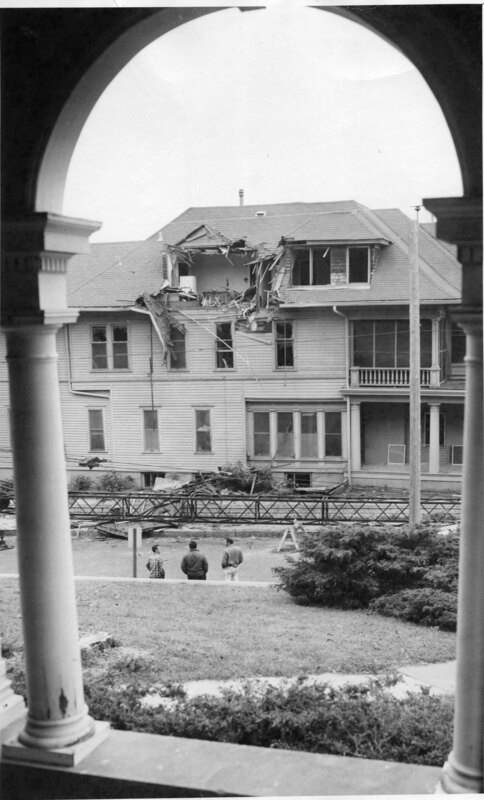 Nonpareil photos, “Spite House Bite Taken,” Council Bluffs Public Library, accessed April 21, 2019, https://www.councilbluffslibrary.org/archive/items/show/5042.